The PDX Taproom (pdxtap.com) is certainly impressive in its dedication to its chosen theme. Cans and bottles from breweries across Oregon line the window-side bar, overlooking what is otherwise a laid-back residential neighborhood. On one side of the bar, a TV plays video of Portland-area hotspots such as Saturday Market, Multnomah Falls, and Deschutes Brewery's Pearl District taproom. There is even a framed piece of the old carpet from Portland International Airport on the wall. However, the real surprise is that PDX Taproom isn't in Portland, or Oregon, or even on this continent. It's in Tokyo, nearly 5,000 miles away from Bend. "I went to Portland for the first time when I was studying abroad during high school," says Miyuki Hiramatsu, who opened up the cozy bar in the Shibuya district of Japan's capital last fall. "During that time, my host family offered me the first beer I ever had, which happened to be Full Sail's pale ale. It really left an impression on me, in how it tasted and in how beer was such a big thing in general over there. Whenever I went back to Portland on business afterward, it always seemed like beer was such an important part of the culture," she says. Hiramatsu went on to work for the Japanese division of Portland's Columbia Sportswear for many years, helping to launch several company stores in the nation, but her love for Oregon beer never waned. 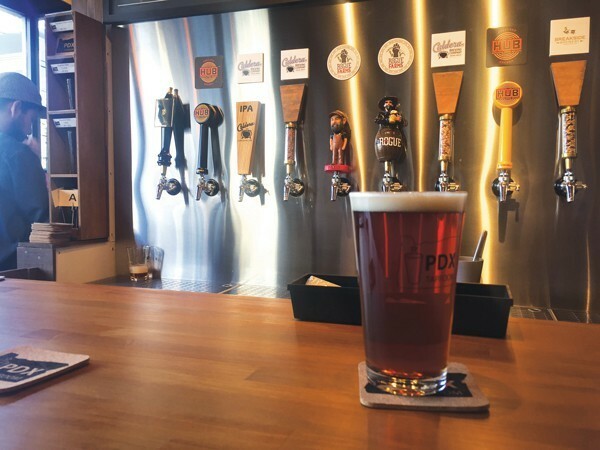 That much is clear when you visit PDX Taproom, which offers ten taps of nothing but beer from the region—no small feat when you have to import all of it across the Pacific Ocean. Rogue has always had a large presence in Asia, but thanks to new distributors like Sapporo-based Oregon Beer Geeks, offerings from breweries like Laurelwood, Coalition, The Commons, and even Bend's own Worthy and Deschutes are starting to appear in beer bars across Japan. Beer is just part of the package at PDX Taproom, as Hiramatsu explains over a 700-yen glass of Breakside IPA ($5.60 in U.S. dollars). "I've tried to make this an open and inviting kind of place, not like your typical bar," she says. "A lot of the clientele here are people from overseas or those who've visited Oregon before, but Portland is starting to be well known here as a hip place for food and fashion. Beer is part of the lifestyle there, and so through this taproom, I want to offer both good beer and a taste of the Oregon experience."